Why would I publish my Wedding on a travel blog? I mean, the Honeymoon is understandable, at least it was actually a big road trip! But my Wedding? Doesn’t really make you think ‘travel’, does it? The reasons are simple really. Firstly, it’s to say a big ‘Thank You’ to all the people (and their companies) that helped us on the way. Also to give you an insight to who I am and what I’m like and correct some of the errors the papers made (yes, my Wedding was worthy of press and TV, apparently having a Bungee Jump Wedding is news worthy…) Plus, I got married a few hundred miles from home, so it kind of fits in with travel! I won’t go into too much detail, as I’m sure no one wants a full diary entry on this! But I’ll give you a brief overview. I hope you enjoy reading this as much as I enjoyed the day! First correction of the papers: I did not get engaged at the age of sixteen. The papers said that I got engaged eleven years ago, wrong. I got married on the day we’d been together for eleven years after being proposed to a year before to the date. So me and my (now) husband got together young, at college and spent quite a bit of time travelling together since Uni. We never really planned to get married, it wasn’t something we really talked about, seemed to be too much like ‘settling down’. But then when we were climbing Kilimanjaro for our ten year anniversary, he planned to (and did) propose. He said it was the perfect time and place, so if we’d decided to marry later in life he’d regretted not doing it there and then. Unfortunately for him, I’ve never liked the idea of having a long engagement, so the planning began. We both knew that we didn’t want to be married the ‘normal’ way. So we didn’t. We decided to literally ‘Take The Plunge’ and that’s what we did. 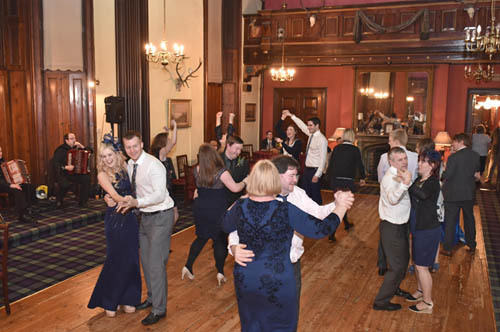 We found the perfect place near Blair Atholl and since we were up in Scotland, how could we celebrate without a Ceilidh? 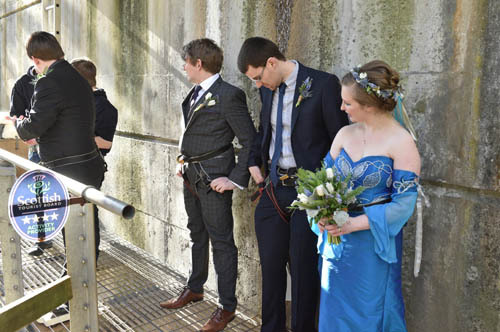 So, on to our Bungee Jump Wedding! We told none of the guests, only the Best Men (I had a Best Man instead of Bridesmaid) knew. The location was the Highland Fling Bungee at Killiecrankie. 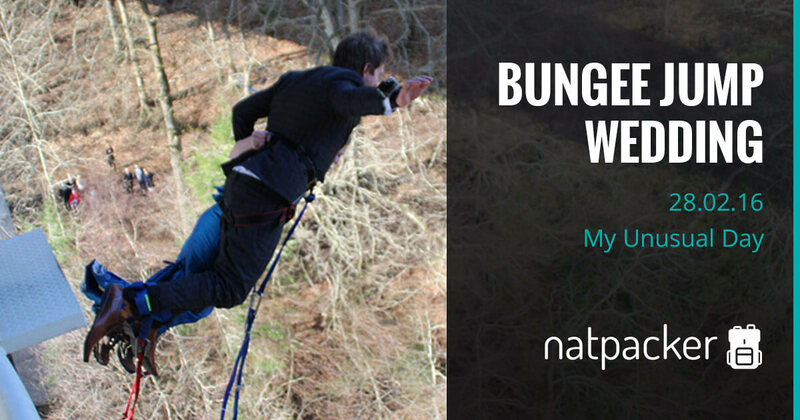 I’d highly recommend the Highland Fling for a Bungee, it’s a beautiful spot and the guys are absolutely awesome – our kind of crazy anyway! Armed with a dress that had been specifically designed to fit the harness (designed and made by Judith Craig Couture) me and Dave, the Best Men and Parents arrived at the visitor centre to meet with our Humanist Celebrant, Jane Bechtel (whose name the papers spelt incorrectly, it was a bad phone line though…) and our photographer, Iain Struthers. So after the initial shock for the parents, we went through the usual health and safety bits, got weighed and everyone got harnessed up. During this time we realised that I’d left that all important paperwork at the hotel! Luckily the guests had not quite left yet, so we were able to get in touch with someone and they were able to grab it. Jane would then meet them off the bus (supplied by Elizabeth Yule Coaches) to get the all important paper work. All harnessed up and ready to go, we got in the Highland Fling minibus and went to the jump site. I hadn’t thought about the climb up to the pod when my dress was designed, so the ladders were a little tricky! We were all up in the pod under the bridge as our guest were walking over our heads to be led down to the viewing area by the piper Ian Sinclair. I won’t bore you all with the details of the ceremony, we kept it short so the guests wouldn’t freeze! We’d set up a speaker so that the guests could hear the ceremony. 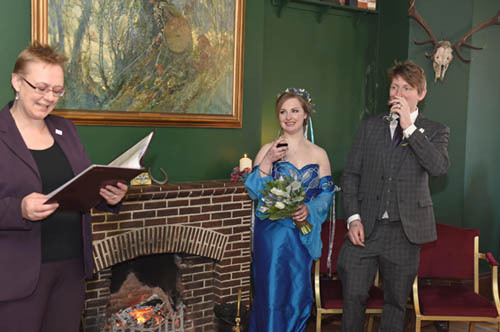 So we went through what you have to go through, hand-fasting, vows, rings (which we made with ‘Make Your Own Wedding Rings‘), the legal declaration and paperwork, being declared ‘Mr and Mrs Took’. After which Jane could no longer be professionally involved (as marriages must be conducted ‘safely and with dignity – apparently jumping off a bridge doesn’t meet this criteria) we shuffled over to the jump platform. I didn’t take my husbands name. We have decided to take a new name together (once again telling no one of our plans). Took has nothing to do with Lord of the Rings, it’s worse, it’s for the pun. We completely ‘took’ the mik. We barely did a thing you’re meant to do. I wasn’t taking his name as when hereditary surnames first came to England, when a woman was married she had no surname and pretty much ceased to exist. This can still be seen today when people address post to ‘Mr & Mrs Husband’s first initial & Surname’. So I don’t like that. It seemed pointless to turn it on its head and have him take mine and our surnames wouldn’t have worked as a double barrel. Taking a new name together seemed like the best idea. So we ‘Took’ the name. A few safety checks and clips later, we were ready to jump. I threw my completely biodegradable bouquet (made by Coach House Flowers) and then we followed! The tandem was actually much easier than doing a single bungee. By the time you get to the point where your brain kicks in with ‘that’s a long way down…’ the weight of the other person has pulled you past the point of no return. There was a further shock when one of the Best Men also had a jump! After getting the harnesses off we went back to the hotel, where the guest had already been taken to, (The Atholl Arms). I had to head up to the room for the removal of walking boots and base layers, before heading into a side room for mulled wine and nibbles. Whilst everyone was sipping and nibbling we gave a bit of an explanation about what’s just happened and the name change for the guests. We also did some of the normal stuff like the Best Men Speech and the cutting of the cake. At this point we added a Scottish tradition, drinking from a Quaich, which is a Scottish two-handled drinking cup. Haha, what an awesome wedding! … And you know what is crazy! …. 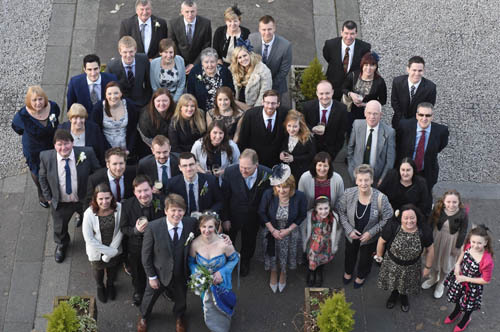 my twin brother got married in Aberfeldy and Jane conducted their wedding too! What a small world 🙂 Cool blog! Went to Scotland for my son’s wedding. 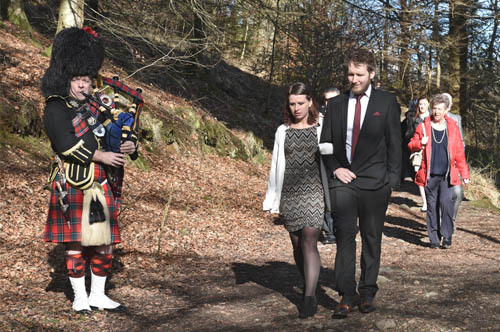 They got married on the lawn of an old huntling lodge in Aberfeldy by – guess who. Jane Bechtel. She was absolutely awesome. Awesome! She really is great! This is incredible! While I don’t think I’ll be doing the same thing myself when I get married, I’d love to attend a wedding with this. Talk about taking the plunge. Sounds like a great day! This is probably the best wedding I have ever heard of! 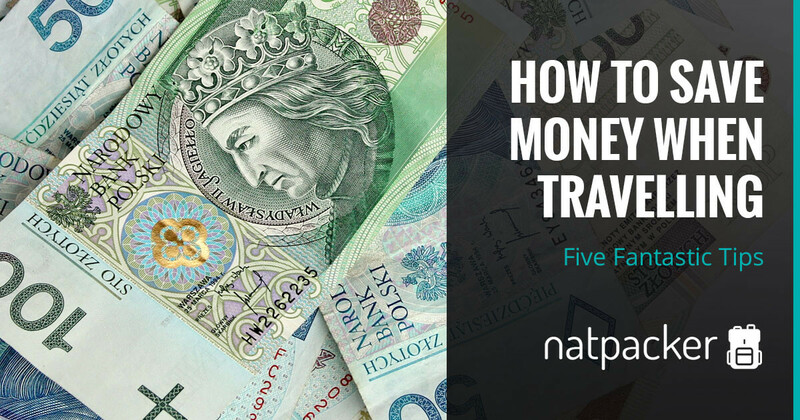 If you want to experience everything on your travels, you'll have to budget. Here are my five tips to help you save money on the road!